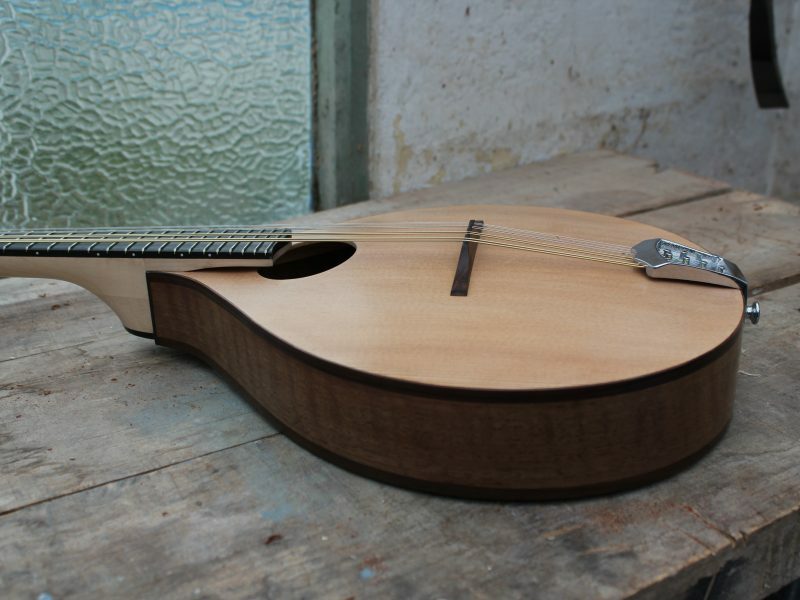 I am Cas Davey, luthier at Davey Mandolins, and I’ve been making instruments to my own designs for 10 years. My interest in music stems from being brought up in the trad music and dance scene in Cornwall, and travelling to festivals far and wide with my father’s ceilidh band from a young age. After some time, it was inevitable that I would finally learn to play an instrument. I got stuck into playing the guitar for a couple of years, before progressing onto the mandolin, becoming the third generation in the family to play. I gained a keen interest in repairs and setups through working for a local music shop for 7 years in Cornwall. For me, the shop floor experience was invaluable in finding out what people want out of an instrument. After a few early attempts at making my own instruments, I bit the bullet and travelled to Michigan, America to learn my trade properly. I have since refined my own designs to best reflect what I, and others, like to see and hear in an instrument. I am a firm believer that instruments should be loved and played, not kept in a glass cabinet for fear of being dinged. My range of mandolins is based on a couple of body shapes with as many variables as I can fit in to make your instrument unique to you. Whilst mandolins are known for being quiet instruments, I pride myself on making them loud; maybe not loud enough to take on a tenor banjo but more than enough to stand up against other flat-top mandolins! The selection is currently focused mainly on short-neck open-back tenor banjos, perfectly proportioned for the trad music session scene. A small selection of individually hand-built instruments, from a petite tenor through to specially designed bigger beasties with dropped tuning.